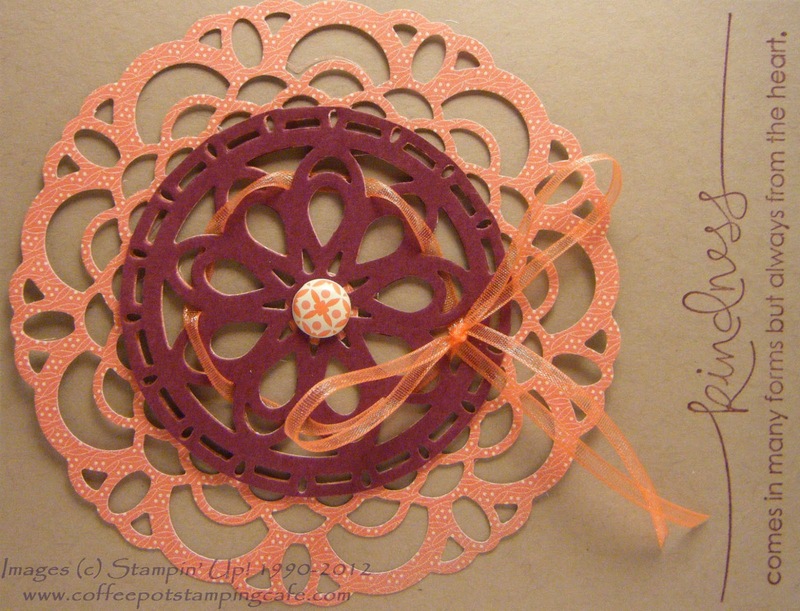 Since becoming a Stampin' Up!® demonstrator, I've met a lot of friends through our Stampin' Connection demonstrator only site. One of those has become a frequent phone pal and we have some very good conversations. Jean is full of ideas and information and I love visiting with her when we both have the time. She recently blessed me with some product that I did not have in my supplies. It was a wonderful and thoughtful thing for her to do. Today's design is one dedicated to Jean and features all the goodies she sent me. I love how the new Paper Doily Large Sizzlits Die cutout looks on this card. My only contributions to the card are the card base and ink color. I used Crumb Cake Card Stock for the base because I know that is Jean's favorite. Thank you, Jean, for your generosity and for letting me bend your ear on those long phone calls. I am blessed to call you friend. You too can become a part of this great online community. Sign up and join my team today!